A nice thing about the Sit & Stitch sessions at Stitchcraft is that folk are keen to share their ideas and show their work which makes it a great source for inspiration. At last weeks session (a bit late but where did the rest of the week go?) I saw several things worth sharing on here. 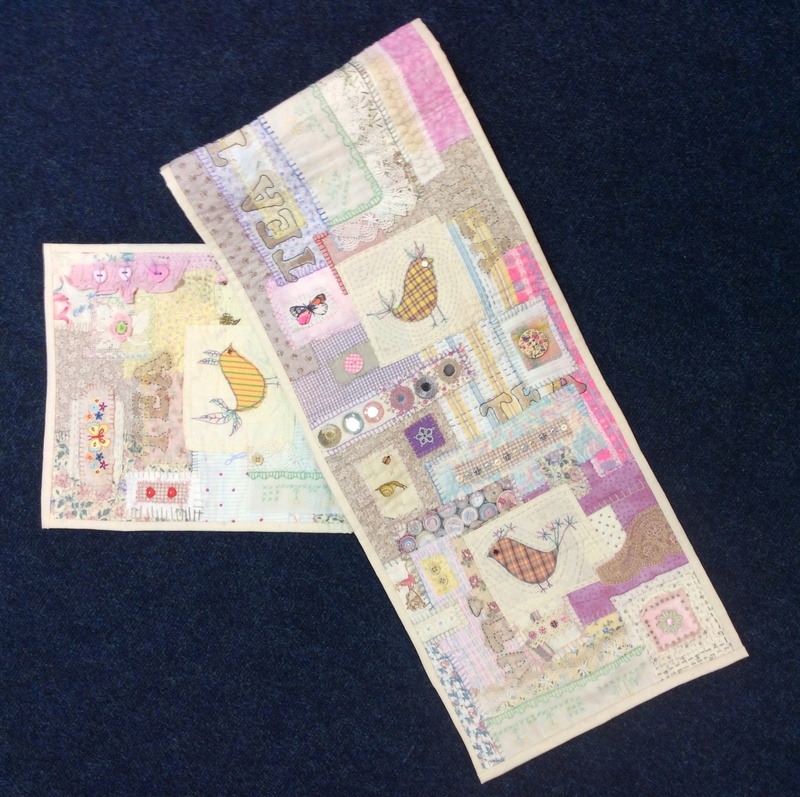 The first is this fabulous “Seahorse” quilt being made by Jane Falkous. 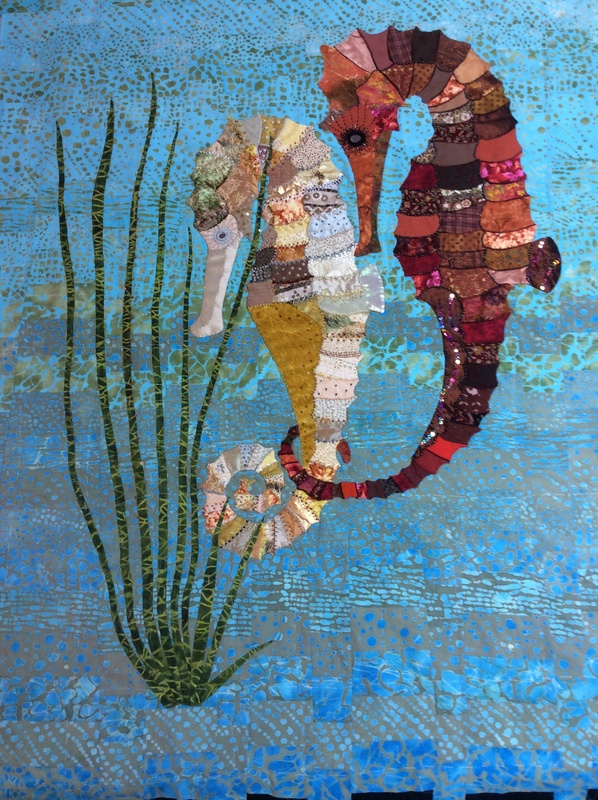 The background is made from jelly rolls while the sea horses are the result of paper piecing. It’s huge, colourful and very dramatic. I love the beading and the combination of fabrics that Jane has used including some gorgeous velvets. These three beautiful brooches were made by Wendy Coyne at a workshop which was held by Diane Bates. 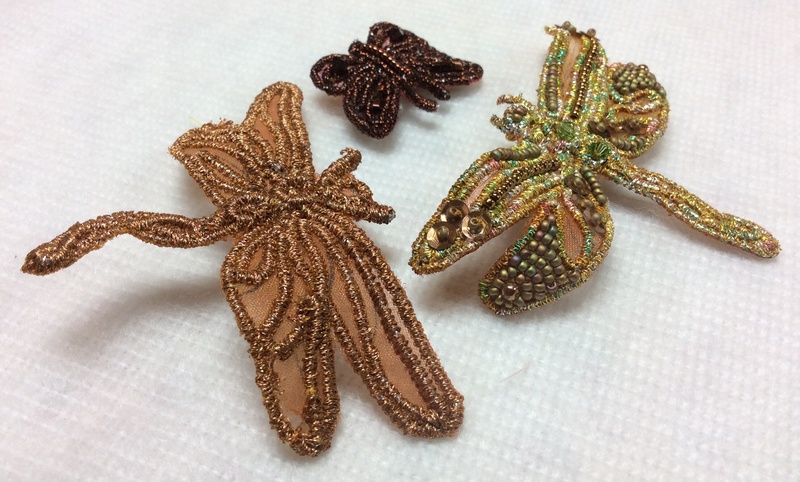 Wendy has made them using organza fabric, metallic threads and beads. The wire was wrapped with the metallic threads using machine stitching. Wire wrapped dragonflies created by Wendy Coyne. Last, but not least, is Tina’s table runner. I love Tina’s work and this particularly caught my eye as it’s the sort of thing you can look at time and time again and still discover something new. Tina combined scraps of fabric, hand sewing, buttons, lace and staining with walnut oil to create this interesting piece. A table runner runner created from scrap fabric and made by Tina Slipper. ← Olga’s work in progress…..